It was the night the lights went out in Silicon Valley — almost. The events read like something from an action novel — definitely. And the story matters to you if you enjoy the convenience of household electricity… or if you’re looking for a lucrative and cutting-edge investing opportunity. In the early hours of April 16, 2013, saboteurs cut telephone cables about a half-mile from an electrical substation in San Jose, Calif. A half-hour later, they opened fire on the substation — likely with AK-47s — and during a 20-minute span, they knocked out 17 giant transformers. And then they slipped away. There was no blackout. This time. Pacific Gas and Electric (PG&E) rerouted power around the substation, kicked up the output from nearby power plants and asked customers to conserve. Still, the repairs took 27 days. At the start, the investigation was only local. By December, the FBI was on the case. By February this year, The Wall Street Journal pieced together the story of a meticulously planned attack, replete with details previously unreported. The snipers left behind more than 100 shell casings — with no fingerprints. There were small piles of rocks nearby — perhaps the work of an advance scout showing the saboteurs where they’d have the best aim. 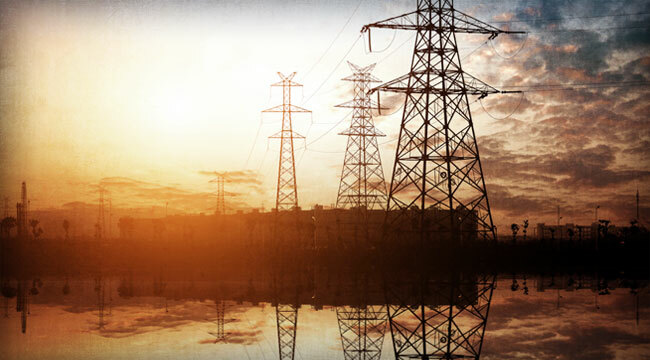 Now consider this nightmare scenario cooked up by the Federal Energy Regulatory Commission (FERC): Imagine a heat wave covering much of the country… and saboteurs taking down eight other substations, strategically located. That’s only nine total out of 55,000 across the country. But who did it? And to what end? A year later, there’s no suspect, no motive. Well… it was about 12 hours after the Boston Marathon bombing. Of course, that fact of timing proves nothing. But it adds to the intrigue. “The purpose? Hard to say,” ventures our own Byron King. We turn to Byron for insight because the San Jose substation attack lies at the intersection of his two fortes — energy investing and military technology. If you don’t already know, our resident Renaissance man has been at various times an oil field geologist, a Navy flight officer and a military historian with the Naval War College. “If it’s not a couple of bubbas drinking beer and shooting out the transformers for fun, it’s also not a high school prank,” he avers. “Terrorists practicing? Showing their stuff? Maybe — but just one attack? Why one? Why not a slew of them? And why on a remote site, where the impact can be mitigated by load balancing by PG&E? We don’t know. We may never know. But we do know a lot of money will be spent to try to prevent future incidents… because it’s a harbinger for more and bigger attacks. Wait a minute… Internet submarine cables? The fiber-optic cables lying at the bottom of the sea comprise one of the most important “pipeline” networks in the world. More than 90% of all Internet traffic runs through undersea cables. The way the Internet works, the email you send across town might well traverse one of those cables before it reaches its destination. “Without this critical resource,” says Byron, “your lights wouldn’t turn on when you flipped the switch… you couldn’t use your smartphone… hospitals could not function… the banking system would all but shut down… and even the shelves at your local grocery store would quickly be empty. We’ll take a moment to interject: The Nasdaq exchange still hasn’t explained what was behind the “glitch” that halted trading for three hours on the afternoon of Aug. 22, 2013. December 2006: An earthquake severed cables off the coast of Taiwan, disrupting telecommunications in Taiwan, Singapore, Hong Kong, South Korea and Japan. Shooting up an electric substation… or severing an undersea Internet cable… are classic acts of asymmetric warfare. If you have a war to fight and you don’t have the resources to meet the enemy on his own terms, you fight asymmetrically. The ragtag rebels in Iraq who used roadside bombs to attack passing U.S. tanks were resorting to asymmetric warfare. While technology can’t solve every problem… it does have the potential to neutralize acts of asymmetric warfare. Among the companies in the forefront are those that equip the U.S. military for traditional warfare with tanks and ships and planes — the “Big Five” defense contractors who belong to one of our longtime suggestions, the iShares US Aerospace & Defense ETF (ITA). Consider Northrop Grumman, which makes up 5% of the ETF’s holdings. Its technology has the potential to stop the Internet cable-cutters in their tracks. “Northrop Grumman is taking innovation to the next level,” says Byron, “with amazing new automated combat systems that could keep watch over the most far-flung fiber-optic cables, even in today’s climate of budget cuts and downsizing. 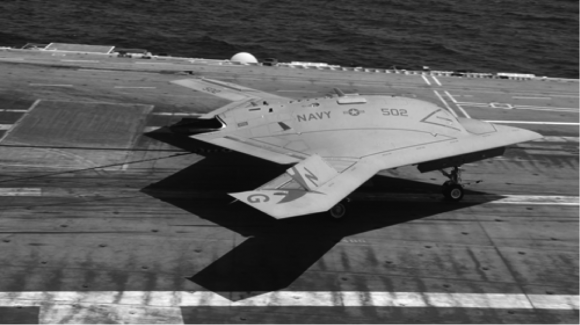 “They’ve developed truly impressive drones, such as the MQ-8 Fire Scout and the X-47B unmanned combat air system. The X-47B stealth drone as it’s catapulted off the deck of the aircraft carrier USS George H.W. Bush. Still, there’s a hitch — those drones have to be based on carriers and cruisers. And the Navy can’t have carriers and cruisers posted at all the Internet’s “choke points.” So Northrop is developing ways to launch drones from other Navy vessels — even submarines. That’s just one example. ITA components Boeing and Lockheed are also in the vanguard of military high-tech that can respond to asymmetric threats. We first suggested ITA 3½ years ago. It’s the touchstone of our “make the empire pay” thesis, which we first began exploring in our 2006 book Empire of Debt: The empire has a logic all its own. That logic will bring about events beyond your control. It is far better to understand those events and plan your life and your “portfolio” accordingly… than to allow them to blindside you and your family. In other words, you might as well try to channel some of your tax dollars back into your own pocket. Up 80% since we first wrote about it, ITA has spanked the S&P 500, which is up about 50%. We have every reason to expect that outperformance to continue. And with ITA pulling back along with the rest of the stock market right now, you’ll soon have another chance to buy in if you missed it the first time. P.S. If the defense ETF interests you — you should sign up to receive the Daily Reckoning by email. We’ll update you on its performance and other plays like it. You’ll also receive daily market coverage that we don’t post to our website. To sign up for FREE right now, simply click here.